One of our clients Etheringtons Solicitors is offering two FREE breakfast seminars. Have you ever thought of selling your business or maximising the value you can get when it comes to selling? One of the seminars covers this topic and can get you prepared. 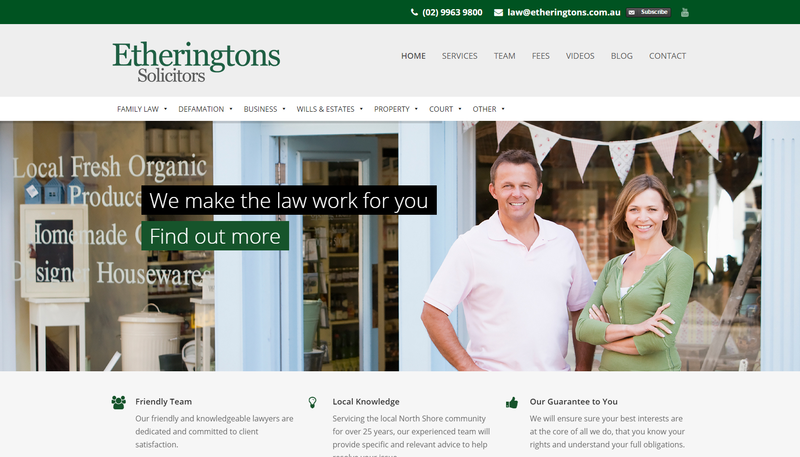 Read more on the Etheringtons Solicitors website. The first event is on 16th July in North Sydney – Buying and Selling a Business – Planning Ahead. We have worked closely with Etheringtons to give them the best possible online presence and bring in new inquiries for their services. We are doing ongoing Google SEO to keep them ranked highly and also recently re-designed their website to make it look professional, attract visitors and inquiries. They are currently ranking on page one for a number of competitive keywords. You can review the website design below along with the client feedback. If you would like me to review your website we’re offering A Free Website Marketing & SEO Audit, click here. Get your Free Website Marketing & SEO Audit, click here.